Brightly coloured hand and foot holds form climbing routes across turquoise walls at this bouldering centre, set inside an industrial building in Minneapolis. Following the success of the franchise in Seattle and Austin, the Minneapolis Bouldering Project opened in November 2017 at a riverside complex. 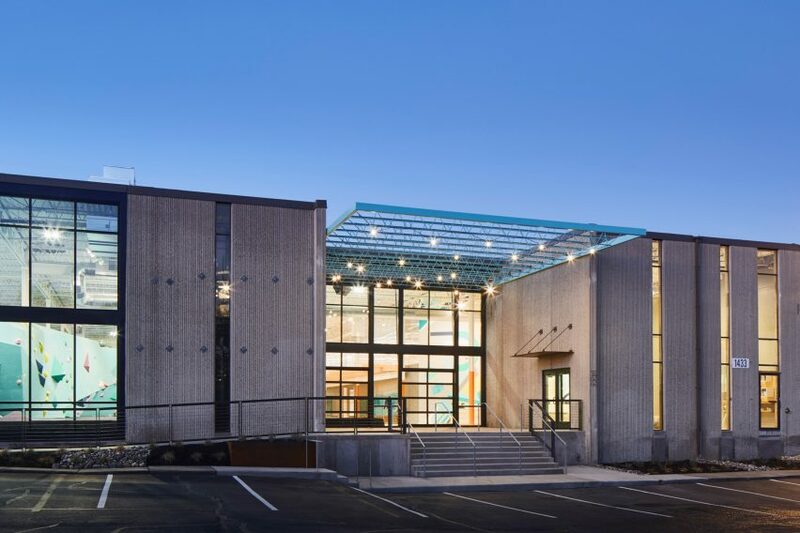 The building formerly housed office, manufacturing and warehouse spaces, but was overhauled by Dylan Johnson of DJA Architects and interior designer Lilianne Steckel. They joined together a pair of two-storey suites, creating a space that totals 44,097 square feet – almost half of which is dedicated to climbing. 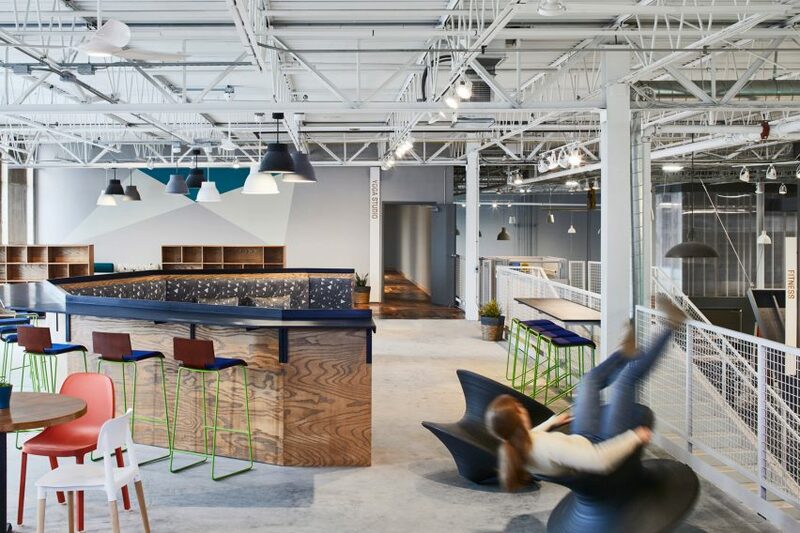 “Working together [we] wanted to create a bouldering environment unique to Minneapolis that blended the inherent industrial bones with an energetic and inviting space that felt synced to the active community,” said the duo. The building’s front facade features large expanses of glazing that allows views of the colourful equipment inside. A large metal canopy extends out from the recessed entrance, mimicking the trussed metal ceiling structure inside the main hall and also carrying lighting fixtures. “The dramatic window-scape of the building facade gives you a glimpse inside, instantly drawing you into the activity of the main climbing zone and reception,” said the team. In the double-height lobby area, a reception desk is angled and placed in front of a large mural by local art group Impulse Creative. There is also a small merchandise display that can be easily folded away. To the left, the bouldering zone unfolds in an open space beneath the high industrial-style roof. A series of faceted structures, which vary in size and shape but are all coloured turquoise, are peppered with multi-hued holds that offer climbing for all abilities. Thick padding draped with a black cover is fitted across the entire floor in case a climber falls. Running past the recreation area, a corridor connects the other spaces within the centre. A frame of steel beams painted white and orange informs the general layout. Changing areas are provided on the ground floor, while a staircase leads up to a mezzanine area that can be used as a co-working lounge. Translucent panels provide obscured views of the bouldering zone below, while colourful furniture breaks up the otherwise grey surfaces. Private rooms – including a space with exposed concrete walls and a herringbone parquet floor – can be used for classes, yoga, and birthdays and events. Climbing walls can make for dramatic interiors, with larger-scale examples including a sports centre in the Netherlands and a dedicated complex in northern Italy. Some are lucky enough to have access to private bouldering walls, like the owners of a house in Tokyo and residents of a home in Wyoming. Photography is by Andrea Calo.